Carrying around your own Wi-Fi hotspot is nothing new. As a matter of fact, there are a few major companies that offer services ranging from hotspot data plans (if you have a smartphone) to compact, portable wireless routers that serve as mobile Wi-Fi hotspots, or Mi-Fi. The problem with these services, though, is that they are either too limited in capabilities, too binding, or too expensive to maintain on a tight budget. 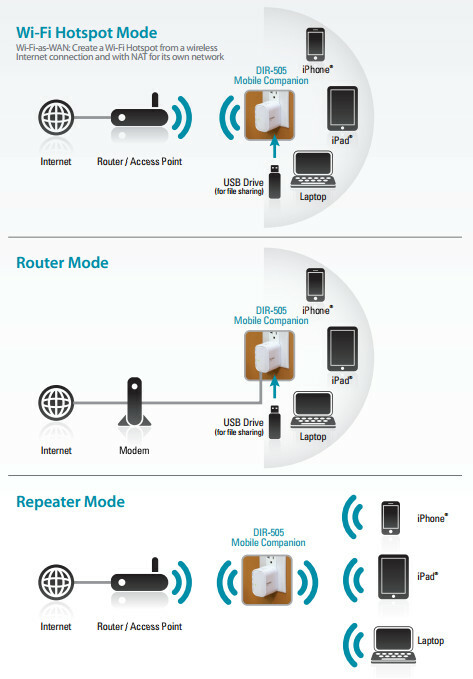 To combat these problems, D-Link released the DIR-505 USB SharePort All-in-One Mobile Companion. Designed to make the lives of smartphone and tablet users a little more convenient, the pocket-sized device is a portable router/access point, Wi-Fi hotspot, and Wi-Fi repeater all rolled into one. 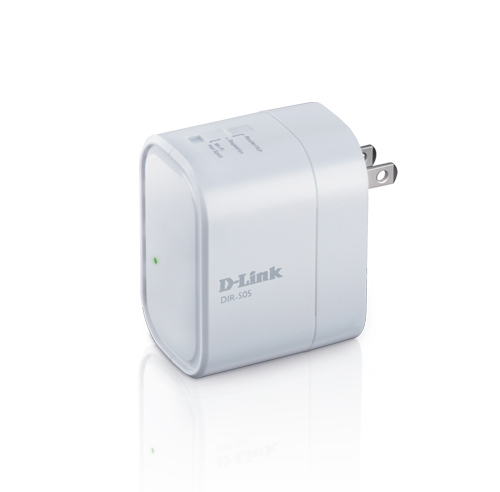 And, in case a charger was lost or forgotten, the D-Link DIR-505 will also charge your smartphones. The device’s main feature however, is its sharing capabilities. When a USB device is connected to the DIR-505 port, the DIR-505, with the help of the free D-Link SharePort app (available in both Android and iOS), helps users share any kind of digital content between the USB device and the smartphone or tablet. Videos, music, photo, and other files in the USB device can be transferred effortlessly to an iPad, iPhone, or Android product. This is made even easier by the fact that the DIR-505 supports a decent list of video, music, image, and document formats. Being able to backup iPad, iPhone, or Android files to any cloud service is also a nice addition. Since the device will most likely be used as a mobile hotspot, it possesses firewall features such as Network Address Translation (NAT), Stateful Packet Inspection (SPI), MAC Address Filtering, and DMZ support. On the hardware side of things, the DIR-505 has a lot to offer. In an attempt to live up to its name as the All-in-One Mobile Companion, the device features an integrated USB port, an Ethernet port, a built-in AC plug, and a three-setting switch for a customizing its wireless behavior. The built-in AC plug reduces tangled cable situations and allows the DIR-505 to be plugged into a wall outlet to activate the instant Wi-Fi. Weighing at less than a quarter of a pound (0.23 lb) and measuring at 2.77 x 2.60 x 1.69in (tinier than a mouse), the device is extremely portable while ensuring that it doesn’t block other power outlets. The three-setting switch located on top of the device lets the user choose between using it as a hotspot/router, repeater station, or access point. The repeater station setting seems to be the most interesting, since it boosts the signal of any existing Wi-Fi, expanding the area of Wi-Fi access. Currently, the D-Link DIR-505 is available online at Amazon.com and other US retail sites, as well as brick and mortar US outlets. But at a list price of $69.99, do you think this device is a good investment for business travelers or anyone on-the-go? This entry was posted in Articles, D-Link, Wireless USB Technology and tagged D-Link DIR-505 USB SharePort, D-Link SharePort app, D-Link USB SharePort, DIR-505, Mi-Fi, mobile Wi-Fi hotspots, portable wireless routers, USB device, Wi-Fi hotspot, Wi-Fi repeater. Bookmark the permalink.